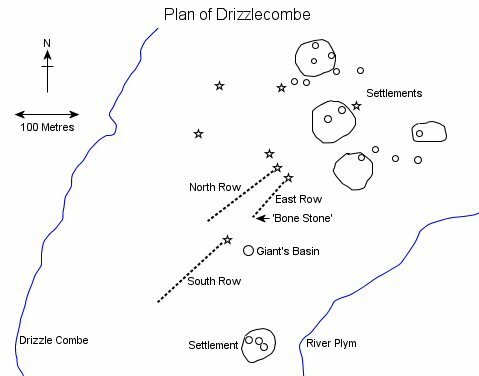 Just a short distance from the famous Drizzlecombe multiple stone rows that cross the slopes of Ditsworthy Warren are the often overlooked remains of a small settlement site and nearby funerary remains including cairns and cists. 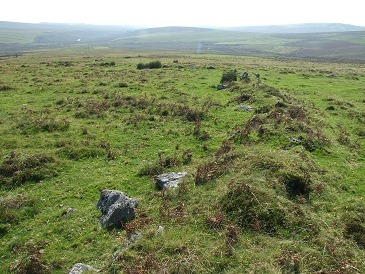 This settlement is divided into two areas, a small enclosure to the south of the rows and a group of four enclosures that stand on slightly higher ground beyond the northeastern end of the rows. Each enclosure contains the remains of one or more huts while traces of several other huts lie scattered around the northeastern enclosures. The enclosures themselves consist of earth and rubble banks (picture lower left) with the three largest forming low walls of about half a metre in height and measuring between 60-70 metres in diameter while the forth is much smaller at just 20 metres across its widest point. It could be that the walls were once much higher and designed to stop livestock straying from the huts with each enclosure belonging to a separate but related family group. 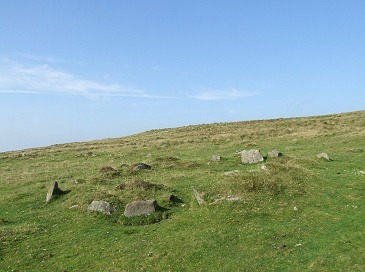 The low rings of stone and rubble forming the remains of the huts that occur both inside and outside the enclosures vary in size, some are just a metre and a half in diameter and may be interpreted and storage areas, perhaps for grain or meat, while others are larger being between 5-8 metres in diameter. It is to be assumed that these larger hut circles are the remains of the Bronze Age roundhouses that were the homes of the population of Drizzlecombe and while the wooden poles interwoven with withies that may have formed the walls and the earth or turf roofs have disappeared the images of roundhouses on the Flag Fen page give some indication of what these houses may have looked like. 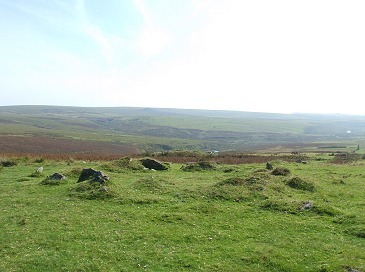 The area to the west of the huts seems to have been reserved for burying the dead although the cairns here seem to be in such close proximity to the habitation area that the two functions of the moor may not be contemporary - perhaps the cairns were built after the huts had been abandoned and the landscape was given up to the dead. The cairns vary in size from 4 metres to 20 metres in diameter with the tallest being just over a metre in height and most show signs of being either partially excavated or more likely plundered by those looking for buried treasure at some point in the past. 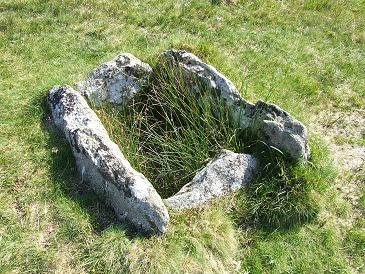 One of the cairns has the remains of a ring or kerb of stones but the most interesting is one that has been cleared of most of its rubble to reveal a fine slab-lined open cist, the capstone of which is propped up at the side of the chamber (picture below left). 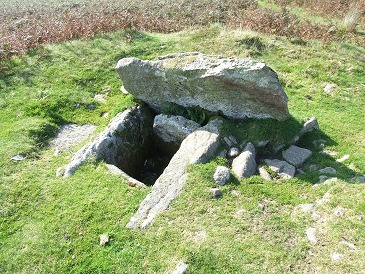 Another well preserved cist but this time without its capstone exists 200 metres to the north of the enclosure area on the western side of the hill above the stream that gives Drizzlecombe its name (picture below right).